World Health Organization (WHO) noticed that environmental noise pollution is assessed as the second most hazard environmental type of pollution after air pollution, especially in densely populated urban areas. EC Report on the Refit Evaluation of END (Environmental Noise Directive) published at the end of 2016 highlighted the variances across Europe in terms of implementation of national strategies for environmental noise management and there is inevitably considerable variance in the quality of “lived experience” of the public administrations who are responsible of the applications of this directive. Therefore, environmental noise management is needed to be applied by the qualified staff with using innovative ways. NTP aims to compare the experiences and strategies developed by the different agents involved in noise management, from the regulatory field to inspection, including aspects related to planning, noise control actions and public awareness. As applicant partner of this project, PMEU (Provincial Directorate of ministry of environment and urbanization – Turkey) has the responsibility of the coordination all the activities in the scope of project management and implementation and budget control. The other partners of the project are: UPM (Universidad Politecnica de Madrid – Spain), UNIFI (University of Florence – Italy) and Vie en.ro.se. Ingegneria s.r.l (Italy). The primary focus for this project is to develop basic and transversal skills with using innovative methods to enhance the capacity of staff working on environmental noise management applications and sustainability. Pan European qualification frameworks will also be developed to allow for accreditation of learning where this is personally motivating the staff. The newness of the project will be enhancement of digital integration in learning and training and to promote learning through Open Educational Resources (OER). The other interesting aspect of this project will be creation of new and effective skills for improving basic capacities in this area through the expertise of project partners in this field. These objectives are fully in line with the Erasmus+ Strategic Partnership aims and correspond with the Erasmus+VET projects priority of “supporting the development of high quality VET with a strong work-based component apprenticeship training, by involving social partners, companies and VET providers. The project started on 2017, October 1st and will be completed on 2019, September 30th. 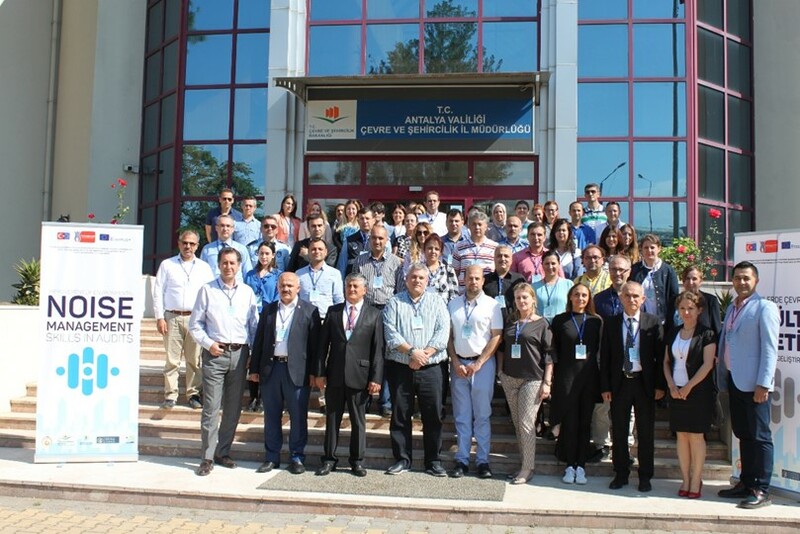  The kick-off meeting was successfully held in Antalya, Turkey on 25 April 2018 with project partners and with large participation from Ministry of Environmental and Urbanization, Antalya Province, Akdeniz University, Municipalities in Antalya, Chamber of Environmental Engineers and private sectors from laboratories working on noise measurements and assessment reports. Nearly 80 people participated into this meeting and environmental noise management systems in Italy, Spain and Turkey were presented by the Project partners. -round table of noise management/ municipalities views.  The third meeting has been realized from 1st to 6 October in Florence, Italy. During this meeting the project’s partners have been began to work together at the curriculum proposal for three professional figures in the acoustics sector, same for all European Countries: the Acoustic Measurement Technician, the Acoustic Engineer and the Acoustic Manager.  The fourth meeting took place in Adalia, Turkey, from 14 to 18 January 2019. The last versions of the Intellectual Outputs have been shared and the measurement campaigns has been performed to show and share the different kind of evaluation of noise by the three Conutries.  The next training will be held in Spain, on October 2019.